Our fantasy worlds are filled with not-so-subtle allusions to technical equipment beyond the limits of their fiction. Blood Bowl has the CAMRA – a bound spirit in a box whose mental image is transmitted by a team of magicians using the spell Cabalvision. And now World of Warcraft is getting S.E.L.F.I.E.s in Warlords of Draenor patch 6.1. The S.E.L.F.I.E. camera is a toy now available on the Public Test Realm. It functions much the same way as GTA V’s equivalent – turning the camera to face the player on the end of an outstretched arm. Photos are saved to the screenshots folder. The camera is currently in testing ahead of patch 6.1. Avatars will even pose and preen while players frame the shot. You’ll be given the device after finishing a new level 100 mission named Field Photography – and can upgrade it to the S.E.L.F.I.E. camera MK II by completing its follow-up, Lens Some Hands. That’ll enable a few Instagram-like filters – sketch, black-and-white, and death. 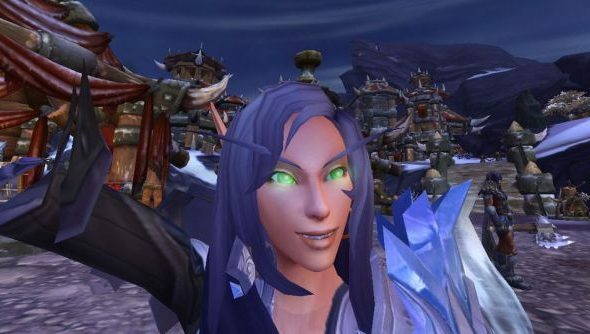 “Who doesn’t like a selfie every now and then?”, ask Blizzard in the toy’s description. Do you?